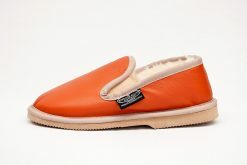 100% Sheepskin liner covered with garment grade leather and EVA sole. Can be worn in light, wet conditions. Lightweight EVA sole, suitable for both indoor and outdoor use. Reinforced heels for extra support.